Chris Forrester (left) and Ryan Tafazolli close down Southend's Nile Ranger. Photo: Joe Dent/theposh.com. Peterborough United are four wins from Wembley after seeing off League One rivals Southend 2-0 in a second round Checktatrade Trophy tie at the ABAX Stadium tonight (December 6). 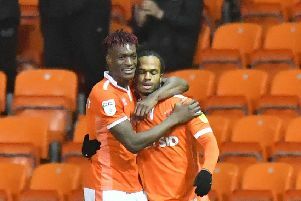 Goals from Gwion Edwards and Marcus Maddison headlined a strong all-round team performance which pleased manager Grant McCann. The draw for the last 16 takes place on Friday (December 8). Posh midfielder Jermaine Anderson has found the back of the net against Southend, but he was offside. Photo: Joe Dent/theposh.com. Posh finished the match with nine men after teenage midfielder Leo da Silva Lopes and centre-back Ryan Tafazolli picked up late injuries after McCann had used all three substitutes. Tafazolli was stretchered off because of a deep cut to his leg, but he’s expected to be fit to face Blackburn in a League One fixture at the ABAX on Saturday (December 9). Da Silva Lopes has a hamstring issue and is more of a doubt for the game against in-form Rovers. Posh fielded a strong team tonight. Only experienced players Steven Taylor and Anthony Grant were left out from the first-choice line-up. “That was a good win and a good performance,” McCann enthused. “We were on the front foot all night. We pressed well and we created plenty of chances. We should have scored more goals, but we played well and we are in the next round which was all we wanted. Posh management pair Grant McCann (left) and David Oldfield discuss tactics against Southend, Photo: Joe Dent/theposh.com. “I have a lot of young lads in the squad who haven’t played at Wembley so this competition offers a great incentive for them. It was a major target at the start of this season to get as far as we can in the Checkatrade. We are only four wins away from Wembley now and this is a good way to get there. We won’t get carried away, but it is a good target to have. “I tried to pick a strong team while also resting some key players. I left the two older players out to get some rest into them. I don’t think Steven Taylor has played this many games for many seasons, while Anthony Grant has been outstanding for us. There were some excellent individual performances by Posh with midfielder Chris Forrester a worthy winner of the sponsors’ man-of-the-match performance. He wasn’t the only one to impress McCann with a return to form. Marcus Maddison fires Posh 2-0 up against Southend. Photo: Joe Dent/theposh.com. “Jermaine Anderson missed a great chance to score,” McCann added. “But I was just pleased he got into that position. Jermaine used to do that all the time before his first injury and he’s slowly returning to that form. “I played him further forward along with Leo to give Jack Marriott more support and it worked well. If Jermaine hadn’t picked up that first injury he wouldn’t be with us now and we want him to get back to that form. “He’s had a rough time since his last start at Rochdale, but he has never sulked. He’s worked hard in training and he earnt his recall tonight.